Barnsley's Championship relegation fears deepened as they were beaten at Ipswich who parted company with manager Mick McCarthy at full-time. Tykes' Kieffer Moore hit the bar and Lloyd Isgrove had a goal disallowed before Jonas Knudsen scored for Town. The Denmark defender glanced in Mustapha Carayol's corner at the near post early in the second half. Moore was denied late on when he had a shot cleared off the line as Barnsley searched for a late equaliser. McCarthy had planned to leave Portman Road at the end of the season, but the club announced the 59-year-old's departure at the end of the game. Barnsley remain third from bottom and two points adrift of safety with five games to play after fellow strugglers Bolton, Birmingham and Reading all lost. Jose Morais' side do still have a game in hand on all the teams around them. Ipswich move up a couple of places to 12th after a first win in eight games. The Tykes will rue a number of missed chances before Knudsen's opener for Ipswich in a first half they arguably dominated. Adam Hammill almost sneaked a cross into the far post before Bartosz Bialkowski palmed it away and Brad Potts hit the side-netting from close range after a neat move. 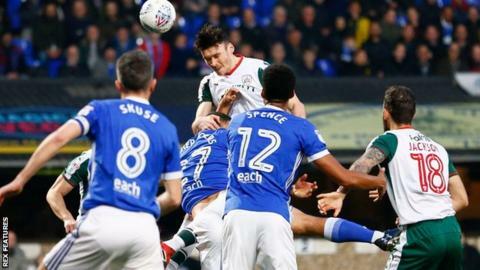 But Ipswich also missed opportunities to make the victory more comfortable with Bersant Celina being denied by a smart Adam Davies save late on. Barnsley boss Jose Morais told BBC Radio Sheffield: "We really expected to win so naturally we feel really disappointed with the result. "We created good opportunities for us to lead the game in the first half, we didn't do it in the second half. "We conceded a goal which I believe with a bit more concentration we weren't supposed to concede. "Football is like this and we need to move on and look to the next game." Match ends, Ipswich Town 1, Barnsley 0. Second Half ends, Ipswich Town 1, Barnsley 0. Tom Bradshaw (Barnsley) wins a free kick on the left wing. Andy Yiadom (Barnsley) is shown the yellow card. Martyn Waghorn (Ipswich Town) wins a free kick in the attacking half. Foul by Andy Yiadom (Barnsley). Attempt blocked. Kieffer Moore (Barnsley) right footed shot from the left side of the box is blocked. Assisted by Liam Lindsay. Attempt blocked. Kieffer Moore (Barnsley) left footed shot from a difficult angle on the left is blocked. Corner, Barnsley. Conceded by Cole Skuse. Attempt missed. Adam Jackson (Barnsley) header from the centre of the box misses to the right. Assisted by Brad Potts following a set piece situation. Attempt missed. Martyn Waghorn (Ipswich Town) left footed shot from the left side of the box is too high. Assisted by Bersant Celina. Ben Folami (Ipswich Town) wins a free kick on the left wing. Foul by Stephen Mallan (Barnsley). Attempt saved. Martyn Waghorn (Ipswich Town) left footed shot from more than 35 yards is saved in the bottom right corner. Assisted by Cole Skuse. Substitution, Barnsley. Stephen Mallan replaces Ezekiel Fryers. Attempt saved. Tom Bradshaw (Barnsley) left footed shot from the left side of the box is saved in the centre of the goal. Assisted by Oliver McBurnie. Attempt missed. Martyn Waghorn (Ipswich Town) header from the centre of the box is close, but misses the top left corner. Assisted by Grant Ward with a cross. Attempt missed. Kieffer Moore (Barnsley) header from the centre of the box is high and wide to the left. Assisted by Ezekiel Fryers with a cross following a set piece situation. Attempt missed. Cole Skuse (Ipswich Town) right footed shot from outside the box is just a bit too high. Assisted by Ben Folami. Attempt saved. Bersant Celina (Ipswich Town) right footed shot from the left side of the box is saved in the centre of the goal. Assisted by Grant Ward with a cross. Attempt missed. Martyn Waghorn (Ipswich Town) left footed shot from outside the box misses to the right. Assisted by Callum Connolly. Attempt blocked. Ryan Hedges (Barnsley) left footed shot from outside the box is blocked. Martyn Waghorn (Ipswich Town) wins a free kick in the defensive half. Foul by Ezekiel Fryers (Barnsley). Attempt missed. Grant Ward (Ipswich Town) right footed shot from outside the box misses to the right. Assisted by Bersant Celina. Corner, Barnsley. Conceded by Jordan Spence.